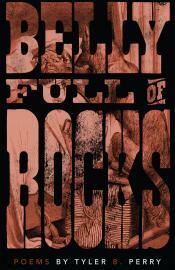 Belly Full of Rocks, Tyler B. Perry’s second book of poetry, delves deep into the psyches of Red Riding Hood, the Wolf, the Huntsman, Mama Bear, and other fairy tale characters as they struggle to piece together their broken lives. The wolf, bloated, torn and battered, is pulled by a dark hunger into the city. A rebellious Red Riding Hood searches for solace in dangerous places, and the third little pig spends his days in the depths of a mental institution built of bricks. These narrative, lyric poems are dark and playful, unsettling and humorous, and refuse to paint their characters as the archetypes they are commonly known to be, instead revealing the primal desires, obsessions and dark urges that are buried within us all.